It's time again for some amazing fun at Pretend City! how you can get 2 for 1 admission ALL WEEK!!!! Transformation and Change – Frozen Fruit! Ice Pops are a favorite summer treat and a perfect opportunity to observe the reversible change caused by cold! Estimation Exploration – Several Seashells – Learn about estimating numbers of objects and practice counting skills as we check our estimate of summertime object – seashells! Weather Wonders – Sun Block Investigation – Why do we have to put on that icky sticky sun block in the summer? Find out in this investigation as we explore the way sun block works to protect us. Hearty Health – Move it! Summer is the perfect time to get outdoors and move it! Today children will explore how exercise changes our heartbeats. Calling all scientists to come out and explore with Sid the Science Kid! Your child’s natural curiosity makes it easy to introduce science concepts during everyday activities. Who better to explore science with than Sid the Science Kid! * Delays are to be expected. Scientific Stories – Daddies Do It Different will be the basis for the start of utilizing the science skills of comparison and observation. Your child will enjoy fun stories while bringing a personal touch to a Venn diagram activity. Sensational Science – Mechanics Machines! Today’s the day to play in the “garage” just like dad! Children and grown-ups will encounter open-ended problem-solving Lego activities designed to enable them to explore, investigate, and solve tasks related to mechanical principles. Creative Construction – WoodWorks! Dads and children alike will enjoy this workshop! Using realistic tools, families can work together to build a take-home project out of foam "wood". Fee: Free. Included with museum admission. Baby Steps through Pretend City with Center for Living Peace! Join us for this very special Baby Steps as we welcome the Center for Living Peace as they present Baby and Me Yoga. Yoga benefits both parents and babies. For parents it provides encouragement to live a healthy lifestyle while assisting to strengthen the bond between you and your child. For babies, yoga builds neuromuscular development. 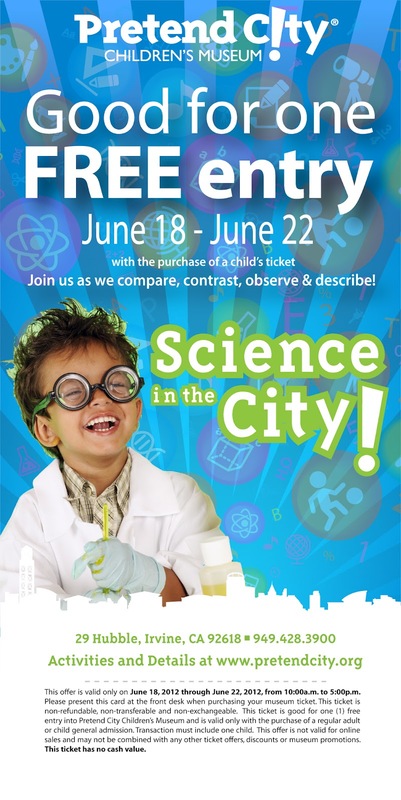 In addition to this wonderful class, make sure to take part in our specialized activities within our exhibits that focus on your child’s developmental play within the city. Parent’s Night Out, Children’s Night In – Get Out, Come In, and Move! 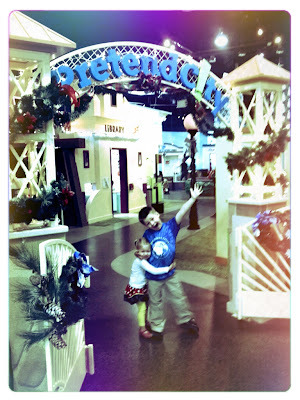 Parents, take the night off and drop the kids off at Pretend City! We'll be moving and grooving to the beat as we learn about keeping our bodies healthy. A special viewing of Sid the Science Kid's "Get Up and Move" episode will surely help burn off some energy just in time for you to pick them up! RSVP: Reservations required by Wednesday, June 20, 2012 to secure your space. 2 for 1 admission for an ENTIRE WEEK!